DUIs may be punished harshly in Arizona, particularly if they are repeat offenses or involve bodily injuries. It is important to have an aggressive defense even if you are only charged with a misdemeanor, especially since any subsequent offense in the seven-year lookback period will be punished even more harshly. If you are looking for a strong DUI defense, you should contact an experienced criminal attorney. Phoenix DUI lawyer James E. Novak is a former prosecutor who puts his insights about how these cases are prosecuted to work for the accused. Although there are substantial penalties for DUI convictions in Arizona, a conviction is not assured, even if you took a blood test. There are numerous potential defenses that we may be able to raise, depending on your unique circumstances. A DUI is a criminal charge. This means that the prosecution needs to establish its case against you beyond a reasonable doubt, a tough standard. A DUI attorney in the Phoenix area may be able to raise a reasonable doubt about whether you had physical control of the vehicle, whether you were impaired to the slightest degree, and whether you had a blood alcohol content of .08. One common defense is attacking the reason why you were stopped. The police must have a reasonable suspicion of past, current, or future criminal activity to pull you over. The reasonable suspicion must be something beyond a hunch. In some cases, police officers act on their instincts and are unable to articulate credible reasons for pulling over a driver. However, you should be aware that the reasonable suspicion that must be present need not be that you were driving drunk. Instead, an officer could pull you over because you ran a red light or because he suspected that you were trafficking in drugs. In order to make a DUI arrest, the police officer must have probable cause. The Fourth Amendment provides protection from unreasonable searches and seizures of your person, home, car, and personal effects. Under the Fourth Amendment, probable cause requires police officers to have a reasonable belief that a crime has taken place, a standard that is higher than a reasonable suspicion. Probable cause includes objective circumstances and facts known to the police that would lead a reasonable person to determine that criminal actions had taken place or were taking place. You cannot be arrested on a hunch that you were driving under the influence, unless the police already have a warrant for your arrest. Sometimes it is possible to attack the evidence used to create probable cause. 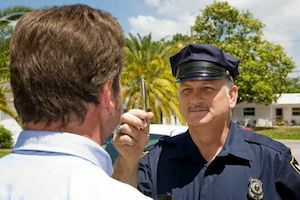 For example, even if you failed a portable breath test or field sobriety test, and this created the probable cause, there may be a basis for a Phoenix DUI attorney to challenge those tests if they were improperly administered. For example, field sobriety tests, such as the horizonal gaze nystagmus, the walk and turn, and the one-leg stand, are supposed to be given following the guidelines of the National Highway Traffic Safety Administration (NHTSA). The guidelines indicate that these tests should not be given if you are 50 pounds or more overweight, have a disability affecting balance, are wearing heels that are 2+ inches high, or are over the age of 65, among other things. Additionally, portable breath tests are known to have accuracy problems, and blood tests are sometimes handled inappropriately by labs. When the evidence used by an officer to acquire probable cause for the arrest does not stand up, the criminal charge for a DUI should be dismissed. There may be other constitutional defenses as well. For example, the police are not supposed to question you in custody without giving you Miranda warnings that let you know that you have a right to remain silent, that your statements can be used against you, and that you have the right to an attorney. It may be possible to get any incriminating statements that you made suppressed if the police fail to provide any of these warnings, or an attorney after you have requested an attorney. You should not take a DUI charge lightly. If you have been arrested for a DUI in Arizona, you should consult a tough, experienced lawyer to present the strongest available defense. James E. Novak represents defendants throughout the Phoenix area, including in Tempe, Mesa, Chandler, Gilbert, Scottsdale, and other cities in Maricopa County. Contact James Novak at (480) 413-1499 or use our online form to set up your appointment.